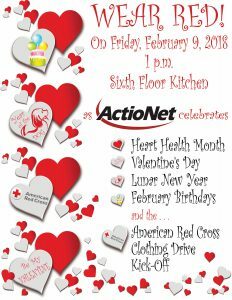 Home / ActioNet Cares / ActioNeters Have Heart! 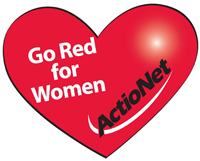 On February 9th, employees will wear red to embrace our motto of Work Hard, Play Hard, and Live Healthy. There are several reasons to celebrate– Valentine’s Day, February birthdays, the Lunar New Year, and Heart Healthy Month, to name a few. Cake is in order! The day also kicks off our American Red Cross Clothing Drive, which runs through April 30th. Employees are encouraged to bring in donations of gently-used or new clothing to help support those in need. The drop box will be located in the lobby of the Vienna Corporate Offices, 10th floor reception area. Join us in celebrating all that February has to offer!